These iconic WNYC ECOBAGS® can be seen all over NYC! Co-branding has been an important part of business since… well forever. But it can also be tricky – for a successful co-branding you need two brands whose products not only fit well together, but whose brand values are in alignment. Why? Let’s look at the unsuccessful co-branding campaign between Shell and Lego that culminated with this Greenpeace campaign. Why was this campaign ultimately unsuccessful? Shell, and almost every oil major oil company, doesn’t have the greatest reputation. There have been numerous leaks of crude oil into the ocean and onto our lands in the past few decades, and more light than ever is now being brought on the issues that these leaks cause. A toy company, like Lego, does not benefit from such a risky partnership. Parents don’t want to buy Lego products when they associate them will the death of Polar bears. What does a successful co-branding campaign look like? A successful co-branding campaign brings together two companies, that may not necessarily have similar products, but do have like minded cultures. Successful co-branding campaigns also help to elevate both partners in their customers and potential customers minds. Your brand values should extend and align with your suppliers and vendors. Here at Eco-Bags Products we made a commitment to social and environmental responsibility in 1989, and it’s a promise we’ve kept these many years later. Our bags aren’t made with child labor. In fact, the factory we uses donates profits to a school so that their employees children are properly educated. All of our factories are fair wage, fair labor, and SA8000 certified, and actually go well beyond what the certification entails. Paying well above the local minimum wages and guaranteeing vacation time for their employees. We are a proudly woman owned business! We are a certified B Corporation – so you can be sure that our business treads as lightly as it can on our mother earth. You’ve worked hard to create your brand loyalty and trust, why would you put your name to a bag that doesn’t align with your values? Last Chance: ECOBAGS®, Sarah Lazarovic, & Trash is for Tossers “Buyerarchy” Giveaway! It’s your last chance to enter our “buyerarchy” giveaway that we are hosting along with artist Sarah Lazarovic and Lauren Singer of Trash is for Tossers. Giveaway closes 9/27/16 at 8PM! All entries must be submitted by 9/27/16 8:00PM EST. The winner will be announced by 9/28/16 5:30PM EST. We will notify the winner by direct message on Instagram, as well as announcing the winner on the original Instagram post. We’re so lucky, we have customers that inspire us on a daily basis. We could keep all of this to ourselves but that would be selfish. So we’ve created this Thought Leader blog series to share their insights with you, our community. We’re curious about why they picked ECOBAGS® to work with and what their deeper philosophies and thoughts are about business and life. Some of the interviews have been by phone, others via writing. We’re doing our best to bring you their best. Let us know what you think after reading these! 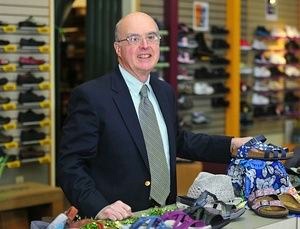 Interview #1 is with Jim Wellehan who leads Lamey Wellehan Shoes, a Maine based retail chain which posted $12 million in sales last year. What is good for the environment is good for business. We asked what launched Jim into business and what inspires him to stay in his business? Jim says his dad inspired him. His father left school in the 9th grade and believed in the concept of thrift. His dad started the family business in 1914, designing and manufacturing shoes. “He was the creator of the Sebago Shoe in 1946.” Jim says “For me becoming a part of the shoe business was a case of Manifest Destiny”. Jim graduated from Holy Cross in 1960, taught overseas in Lesotho for a year, came back in “61 and worked in the business until the start of the New Year. “I went to Fort Dix for basic training, and a six month US Army Reserve program. While there, I decided that I should get more business education before committing to Dad’s shoe business, so I went to Wharton for an MBA, and came back to Lewiston, Maine in early ’64 for an enjoyable lifetime of work in the retail shoe industry”. Jim quips “my third grade teacher always said I wouldn’t go far and she was right”. He’s been creating and guiding this amazingly successful local business from his home town ever since. Jim is inspired by the people he meets in his business. He says “shoe manufacturing and sales has always been a very nice and congenial industry”. He loves the fun and community building aspects of his work. This is what inspires him every day. How do you serve the local community? Jim believes that his business not only serves, but helps to build the local economy. How do you ride the ups and downs of being in business? Jim’s dad had to figure out how to serve his community throughout the depression. “During the 1930s no one had money and people were not buying shoes and in the 1940s there was rationing of resources and folks couldn’t buy things.” Jim’s father believed in “building a good crew, listening to them and giving them respect.” His dad was was conservative and frugal. He believed in always having a financial cushion. Jim credits his father’s business approach. It’s why the company survived & thrived through very challenging times. Creating a frugal culture within the business he insured that the company “would not be the biggest consumer”. Sparing resources kept Lamey Wellehan afloat while other businesses sank. Jim came into the business during the 1960s; a better business climate than the previous two decades of his fathers career. It was a boom economy for a while. Jim, however, remembers that “the economic down turn in the 80’s and early 90’s, a minuscule blip on the national screen, hit Maine hard. The local economy was devastated.” By keeping his father’s conservative business practices in place, Lamey Wellehan continued to grow and was able to support the community by providing local jobs as well as footwear. What are your thoughts on compensation? Jim is a big proponent of fair wage practices. The highest paid staff person is paid a multiple of only 3.5 times more than the lowest paid person. Compare this with Walmart’s CEO who earns 331 times as much as their average worker and 774 times as much as the minimum wage. As small business person, Jim supports raising the minimum wage. He says his company is built on respect and internal investment. Employee retention is amazingly high. Check out Jim in this great video about raising the minimum wage. What are your thoughts on the local and green energy? Lamey Wellehan is a strong believer in engaging the community. Jim believes in local food systems that build the local economy. His retail stores also, regularly host green events showcasing and supporting local solar and other green technology companies. (They have solar installed on their Auburn store.) They also collect gently worn shoes and repurpose them through the United Way for free distribution to those in need. This last action keeps tons out of the waste stream and gives to the community. Who is a Lamey Wellehan’s customer? He says “we’ve cut emissions by 40% since 2003 and are looking towards 50% by 2020. We’ve recycled 95% of our solid waste since 1994 and have improved this to 96% recycled recently.” Adding ECOBAGS® reusable bags has allowed them to reduce solid waste even more (and to engage customers). A key benefit from the waste reduction is that costs have been cut dramatically. ”Since we reduced waste to 5% we no longer need dumpster pick ups.” “Energy costs are down from 1.22% of sales costs to .69% of sales costs. Beautiful Organic Cotton Custom Printed Tote for our friends at Lamey Wellehan. There are a lot of bag companies out there. Why did you choose ECOBAGS® in particular? The bags that Jim chose are all ORGANIC,“ because cotton uses 75% of the pesticides in the country”. Jim chose reusable bags over disposable paper (vs plastic) because “The manufacture and transport of paper bags creates about twice the green house gases that plastic create. It is the growth of greenhouse gases, and their absorption into the ocean that creates acidification. As the ocean chemistry changes to a much more acidic mix, it will become increasingly hard for clams and other bi-valves – in fact, all shelled animals, to grow their shells. Ocean acidification is also devastating our coral reefs, which are a tremendous resource for marine life. So we have to work to reduce the impact of global warming if we want an ocean. “Most customers are just fine with not using a bag at all” says Jim. He holds “LAKPOOTO”, “Let’s All Keep Plastic Out of the Ocean” days at the store to raise awareness and help people change their habits. Jim says “We all look at how we do things. We have to run everything sustainably. Rethinking things as a nation is needed. Millennials are different in their perspective. They didn’t grow up in a place of unlimited resources. There’s a lot more of us on the planet than there used to be. We have to be careful about how we do things. It’s also about how well we treat people, how we respect people”. Among may awards they have reason to be proud of Jim and his wife Kathy Wellehan were honored with the Natural Resources Council of Maine 2014 Conservation Leadership Lifetime Achievement Award for demonstrating that what is good for the environment is good for business. Lamey Wellehan awards scholarships annually to promising Maine students who are going on to university to study the environment or economy. Jim Wellehan – At 76 years of age is still head of this long standing company. His next step will be to sell the company, that he owns with his wife Kathy, to their employees. Learn more about Jim in this great article by Dylan Martin in Mainebiz.